The emphasis on essential knowledge in our core curriculum is time-tested and well-proven to best prepare students for the road ahead, regardless of the academic path they may choose. Additional courses in the following subjects provide students with a well-rounded knowledge. These courses are provided so that students may broaden their academic exposure, explore particular interests, and challenge their special talents. 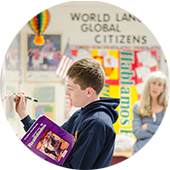 In addition to the five core classes required in each grade level, students will be required to take these additional courses as prescribed by their particular grade level curriculum.